The District’s population has been growing since the 1990s, and has in recent years surpassed other metropolises in terms of total population while expected to continue growing to reach (and exceed) one million residents. This influx of new residents, expats, and seasonal stayers has since made the option of living away from the city quite enticing, and we’d have to agree; you shouldn’t have to sacrifice entertainment, shopping, quality schools, and access to all the activities that make living near The District appealing. A mere 30 minutes from the city’s center, Saratoga Towns gives you the space you need and crave from the unsavory sights and sounds that come with living in the D.C. Conveniently located in the fashionable Saratoga neighborhood in Springfield, our Saratoga Towns community offers residents attractive interior and exterior features that go unrivaled by competitors. Interested in learning more about our Saratoga Towns community? Continue reading to see just how affordable, spacious, and relaxing a luxury home in the Greater Washington area can be. Each of the aforementioned features are coupled and paired with a host of other modern-meets-classic elements, providing your Saratoga Towns home with the energy and style of the city, and the calmness of your quiet space away from The District. Curious about the array of fixtures featured in your future luxury home? Check out our complete list of attractive features and elements that come standard in every Saratoga Towns luxury home. When you become the owner of a CarrHomes-designed luxury home, not only are you choosing a lovingly crafted home built on nearly 100 years of construction excellence, but you’re also selecting a home that has been designed and constructed to provide you and your family with comfort, style, and peace. While all CarrHomes floor plans are drafted with functionality and style in mind, our Saratoga Towns spacious homes were designed with the modern family in mind. We at CarrHomes understand that each of our clients’ needs, wants, and goals vary from client to client. 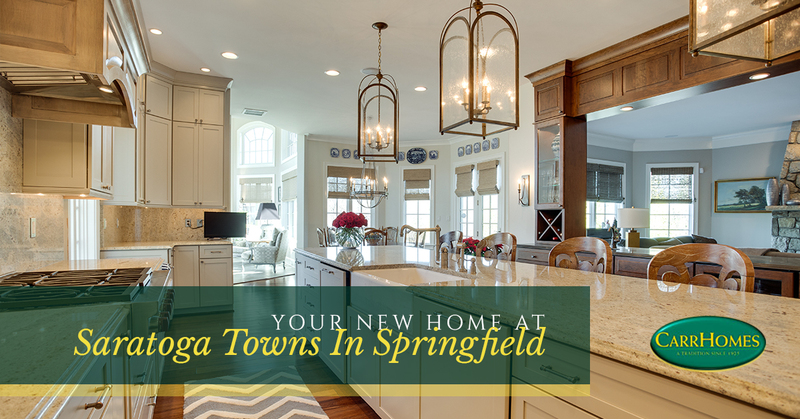 Fortunately, each home in our Saratoga Towns community is easily adaptable to fit your interior styling preferences, with modern fixtures and features. Convinced that your next home is in Saratoga Towns or one of our other luxury communities? Get in touch with CarrHomse today to begin the first step in moving into your new luxury home.